Remember way back in January when I finished my Project 3(six)5? I told you I had an incredible project in the works to showcase the year’s efforts. Well, nearly 9 months later I can finally show it off! I’m scaring you with my speed and efficiency, aren’t I? My friend Tim gave me the idea to take each picture I took over the course of the year and turn them into a mosaic. I chose this photo, one of my favorites of the year that happened to have both Elena and Eli in it, as my main photo. 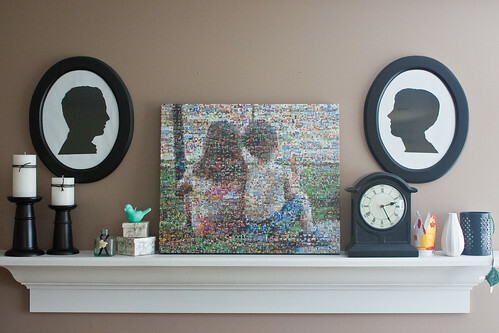 I snagged one of the frequent deals that are offered for canvas prints and had the finished mosaic printed on a 20″ x 24″ gallery-wrapped canvas. I just love the way it turned out. It’s so uniquely ours and always draws comments from visitors. I know I grumbled a lot during that year of taking pictures, especially towards the end. Seeing the tiny fragments of our daily life assembled into something so beautiful, though? Totally worth it. And to think, it only took 365 days plus 9 months for me to see the big picture! 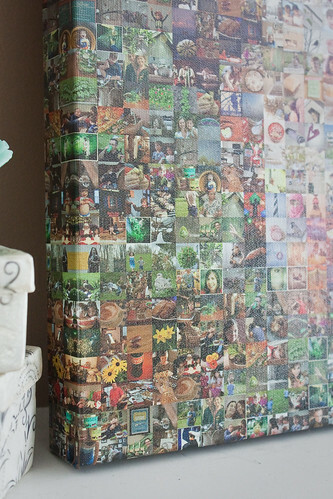 Thanks also for the link to mosaickr. I’ve wanted to make one of these myself and wasn’t sure what to use.